What, Blue Pussycat? Whoa, whoa, whoa! The image comes from this video. Disclaimer: the following post contains speculation, conjecture, monomania, egomania, ailurophilia, confirmation bias and wishful thinking. I am keen on cats in real life. Im also keen on space cats in imaginary space life, such as the psychic gyrinx that featured in Warhammer 40,000: Rogue Trader back in 1987. I am so keen in fact, that I have spent time in my real life prepping miniature space cats for my imaginary life, as can be seen here, here, here, here, here, here and here. A photo of the first one that I worked on, the imaginatively named “Paul”, the one painted in non-canonical blue, is the image that I use for my avatar on Facebook and forums etc. L to R: G.I.N.G.E.R, Steeljaw, Mr. D’Arcy, Mr. Scuttle, Cassis, Paul, Friskers, Rampage. 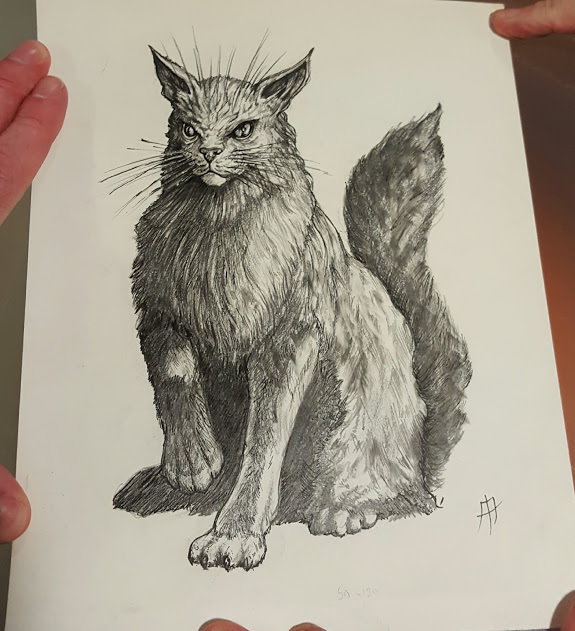 This general enthusiasm for miniature space cats included, with the assistance of Axiom, buying the original piece of gyrinx art from the Rogue Trader rulebook, as seen below. Gyrinx as illustrated in Warhammer 40,000 Rogue Trader, 1987. Here is the original of the illustration, yet to be framed. Did I mention that I own it? Are you sure? Because I do. Own it that is. I own it. The original gyrinx artwork from Rogue Trader, as created by Tony Ackland. Its safe to say that I am pleased to see the gyrinx coming back into the setting. 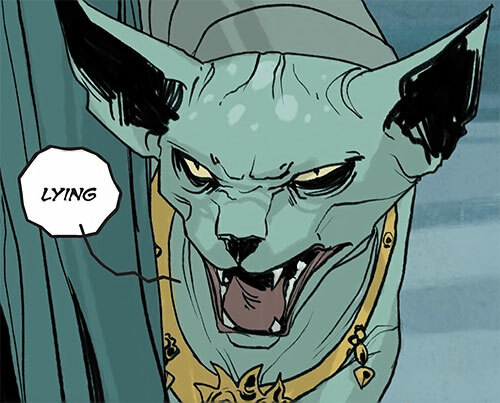 Therefore I can say without a shadow of a doubt that I, through force of enthusiastic will alone, have in fact changed the canon of the 40k universe with regard to the colour of psychic space felines from ginger/orange to canonical blue. 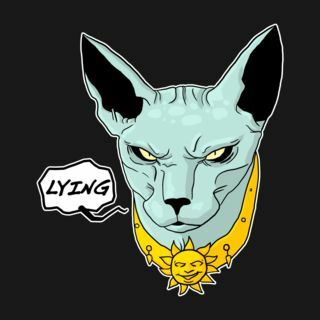 … screw you Lying Cat. It will make you purr with delight, my smugness will give you energy. You sir, win the non-canonical-blue-gyrinx-infested-internet today! Hahahahahahahaha. Nice. I’m glad this creature has made a comeback, it’s a reminder of more whimsical times at GW. Always liked your version; I have a bunch of those Mega Miniatures cats myself for various uses. In these post truth times, its not that outlandish a claim for me to make Al. I bought two set of those Megaminis cats way back, they are quite nice (if rather large if representing a Terran house cat). I ended up giving the duplicates to other folk that wanted to have one for their own gyrinx projects. In fact, Im going to claim henceforth that my campaign to Make Gyrinx Great Again began there, and has finally come to fruition due to my own hard work. The very retro items like a gyrinx do have a lot of appeal, a nostalgia buzz. I would be very happy to see mimics/ptera-squirrels/death ferrets etc (possibly re-named in a marginally less goofy fashion). None of those would likely give me the silly levels of childish delight that I get from the gyrinx though. I still like your gyrinx better, actually. 🙂 But it’s good to see you’re getting some recognition for your crazy space cat housing, feeding, adoption, and pigmentation program. Thanks symphonic poet, you and some few other true believers will be brought up to my court when I am Star Tzar. I have always known that I was destined for greatness. Sometimes people like us just have to wait for the world to catch up. Wow, so I’m guessing you’re a bit of a fan of cats. Space cats. Haha. Great post mate. I don’t share the same love I’m afraid but as soon as there’s such a thing as a space ferret I’ll be smiling forever! There are “Death Ferrets” in 40k. Really. Actually, I had forgotten, but I have painted some Death Ferret proxies. Where can you get that new Gyrinx model? As yet unknown Don. The video is a little bit of marketing hype by GW. But they got the idea from me. Totes. 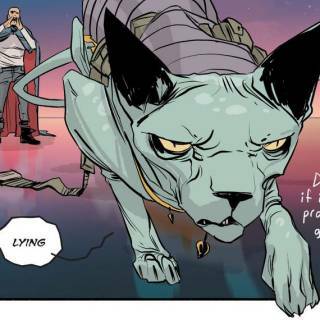 Great to see the Gyrinx making a hopeful comeback, and great to see lying cat doing his thang! 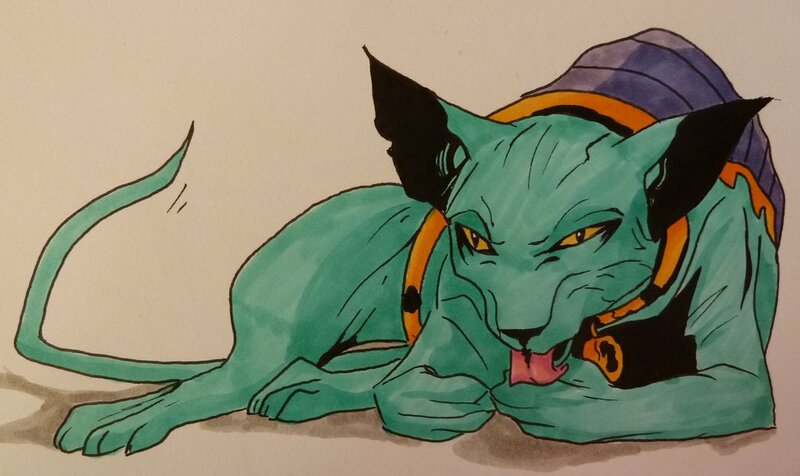 Space-cats look way cooler in blue… fact. “The Future is Bright! The Future is Not Orange! Fantastic, and you know that I approve. I’m impressed on the Grynx picture as well. Did you pick up the Raging Heroes “Jinx”? I didn’t get that. I want it too. I must track one down. Thats really rather nice isnt it? The 28mm (or 30mm or whatever) model appeals to me more than the large one as I would want it for gaming. Im going to have to keep an eye out for that. Although I am unlikely to get around to buying it. Oh, my, it has started. Cheetor is shaping the reality around his vision of the world. Today, space cats. Tomorrow, the galaxy! The new gyrinx design is certainly riffing on Bubastis, but thats ok. In fact the new gyrinx is more of a lynx than Bubastis I reckon, as she shared a lot of characteristics with tigers IIRC. I hadnt really thought about the design being Pokemon like though. Its possibly the lack of fur texture on the model giving it that Mewtwo vibe, is it? Regardless, that aspect doesnt bother me at all really. Modern GW designs do push in a slightly different way in terms of proportion than the older figures that you and I have a nostalgic fondness for. There is certainly a bit of that in this new gyrinx design too. But I am perfectly happy to accept that as simply being part of the inevitable progress of technology and change in aesthetics over time. I might paint my official, old metal gyrinx in the new colour scheme. I feel very pandered to, now that people of approximately my age are now calling more shots in GW. Who knows what sort of things they will use to tempt us to spend more money? Cool – thanks for the post! I hope that you enjoyed it Mark! Heh! I laughed when I saw that. Noice. Owning the original drawing is badass. Should I come to some money I feel some originals of Magic Cards will be in order. 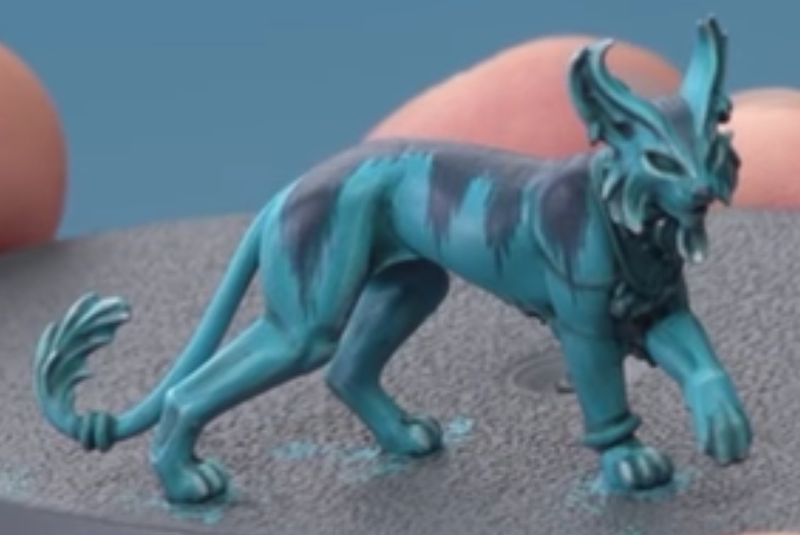 It is certain that you will purchase the cat, so I look forward to your paintjob. No matter if it is more a Pokemon than a Space Cat. Picking up the original was a highlight of last year daggerandbrush, definitely. I really must get it framed and hang it. Was Buxton ever serialised into a comic I wonder [ZHU]? I feel like I have seen it before, possibly as a very young kid in the sort of comic thea featured Sooty and Sweep and maybe the Wombles? Buxton is from “Dougal and the Blue Cat” -The Magic Roundabout movie. The story was adapted into a picture book, which I’ve just spotted a cheap copy of on eBay. It’s very likely the story might have been adapted in one of the TV character comics of the era as well. I didn’t have access to UK TV as a kid, but got the same magazines and comics. My experience of The Magic Roundabout (and Danger Mouse and a few others) came entirely from secondary media like comics. It’s a peculiar angle to know the franchises via. Thanks for the feedback Zhu. Love all the cats! It will be interesting to see what the gyrinx brings along too – awesome looking model! 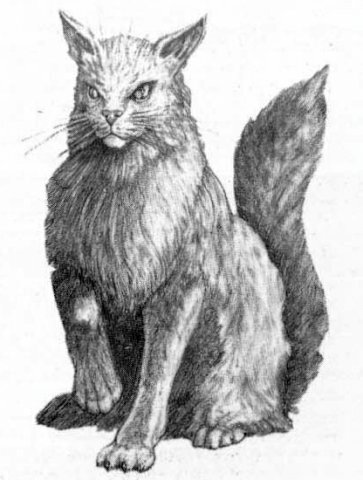 Have you seen the Wolsung cat minis? I have indeed seen the Wolsung ninja cat miniatures. I could very easily find a use for those rather weird things. Previews regarding the gyrinx companion are due pretty soon I reckon. Im looking forward to them too. Thanks for the feedback Poisontail! How splendid to have the world change to the view that you have always seen. Please stop here though, we need not venture deeper into your mind. Like visiting Graceland, tours of my mind are allowed in the grounds and downstairs, but access to the second floor is not allowed. The contents of the next “Aeldari” filled box is really rather exciting. I hope that they release a box like the “Triumvirate of the Imperium” for each faction. I believe that the current rumor is for an “Aedlari” box, then maybe a chaos box, but everything other than that is speculation. But yes, it would be a good way to pump out character/command squad figures.